Benjamin Law during his session on Sh*t Asian Mothers Say. Two siblings of Asian background, Michelle and Benjamin Law, are eminently qualified to write and get away with a hilariously controversial book titled Sh*t Asian Mothers Say. 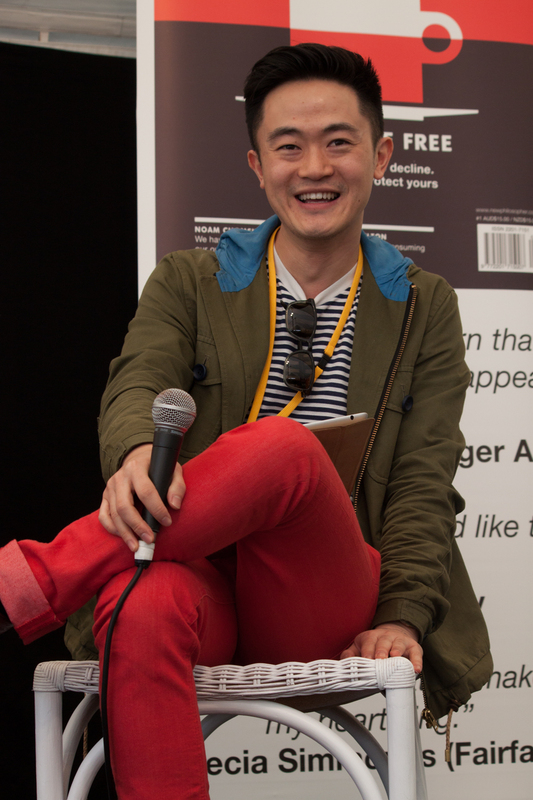 A self-proclaimed ‘neighbourhood Asian and local homosexual,’ and author of The Family Law, Gaysia: Adventures in the Queer East, Benjamin was happy to be at the Byron Bay Writers Festival discussing their “fun little racist comedy book”. Before the book was published, Michelle and Benjamin gave their mother a copy of Sh*t Asian Mothers Say, and were surprised to find her feedback was based mostly around spelling and grammar – not content – with big red ticks and love hearts around the passages she liked. Session chair Moyer Sayer-Jones was concerned that Michelle and Benjamin were holding back on the “mother-dirt” because their mother was in the audience. “She’s in the front row, holding a video camera,” Benjamin added. After hearing the siblings describe their mother’s loose boundaries, Sayer-Jones suggested that not having a strict mother has made Michelle and Benjamin less successful than other Asian children. Benjamin explained that he does have a doctorate, but unfortunately – for his parents – it has the word ‘creative’ in it. He’s not the type of doctor who can save lives. The thing that Asian mothers do, said Michelle, is wear double-leopard print on a visit to the zoo. She said her mother wants their next book to be called Sh*t Australian Kids Say. But, she said that most Australian kids with an Asian parent can relate to Sh*t Asian Mothers Say. Sh*t Asian Mothers Say was released around Mother’s Day, which made it the perfect present to give to your mum, or not! When asked how people should use Sh*t Australian Mothers Say, Benjamin said he’s heard of people reading the book on the toilet. After listening to the 45 minute session of non-stop laughter, I assume most people—like myself—left the New Philosopher Marquee with aching abdominal muscles.